Below is a detailed article on John Bell’s artworks. He was more of a sculptor than a painter. His works are famous to have been exhibited at the Great Exhibition of 1851 by Prince Albert Consort. He received his education from the Royal Academy Schools, London. In 1833, he exhibited at the Suffolk Gallery a sculpture of John the Baptist. This was his first ever exhibition. 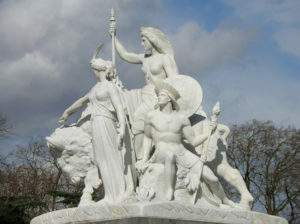 His most significant was his work ‘America’ which is a sculpture that today lies on the Albert Memorial. This granite and marble sculpture were inspired by the bedtime children’s tale. It is about two children being abandoned in the woods or the forest. The story was also made into a cartoon representation by Walt Disney. The sculpture lies at the Norwich castle and was completed in 1842. John Bell completed this magnificent sculpture in the year 1844, however, he waited to bring it out in the Great Exhibition of 1851 where he exhibited the massive structure. He built this at the Royal Academy and earned great respect at the Academy with his outstanding work. He entered the competition held for the structure of the new Houses of Parliaments with this very statue and another one called Jane Shore. Jane Shore was the mistress of King Edward IV of England. He built the Eagle Slayer with cast iron, the first ever cast iron statue seen in the whole of Britain. After the exhibition, it was placed at the entrance of the Victoria and Albert Museum. Today it is at the Museum of Childhood, Bethnal Green in London. The ‘America’ was a contract given to John Bell by Prince Albert of which he accepted a huge commission. It is a marvelous sculpture of young American men and women. The figure personifies America – the country. There is a figure of a bison that represents the great white north – Canada. On the right side is a native american that is personifying the country – America. The sculpture is a complex structure with many interpretations. Critic reviews were both positive and negative as well calling it ‘over presumptuous’. 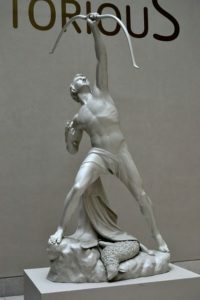 ‘Dorothea’ is a sculpture by John Bell made in 1859 for the Summerley’s Art Manufactory. 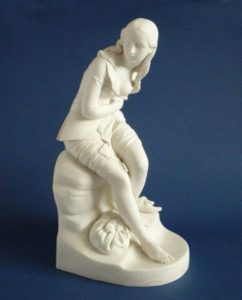 It is a life sized sculpture of a young English girl.